Two new books by ex-members and a golden oldie reissued by a veteran critic of the movement have added to Scientology’s worries in recent weeks. No matter if the mainstream book trade remains nervous about memoirs by former Scientologists: in the age of the Internet a determined writer can bypass faint-hearted publishers. As regular visitors to this site will doubtless be aware, two ex-members, Marc Headley and Nancy Many, have just self-published accounts of their time spent in the movement. Both have shocking tales to tell. But you may have missed the reappearance of another book, first issued well before the Internet age, when writing about Scientology was a far more dangerous proposition. The Ask the Scientologist website recently ran a piece which, while paying due respect to the current generation of critics, pointed out that their predecessors had run much greater risks. John Forte was one of those people. The movement even tried to sue him through the Greek courts: they failed. Major Forte (retired), a veteran opponent of the movement, has brought out a new edition of his 1980 book, The Commodore and the Colonels. Forte was Britain’s honorary vice-consul on the Greek island of Corfu, when L. Ron Hubbard sailed into port in August 1968 looking for new friends, having worn out his welcome in England. Forte’s duties included trying to deliver to Hubbard a copy of the British government’s declaration that he was persona non grata in the UK. Forte described in his book the reception he got when he tried to board Hubbard’s ship, the Royal Scotman [sic]. On this occasion I was met at the gangway by a small boy aged about twelve with a very intent though far off expression on his face who politely but firmly inquired my business. I asked where I could find the captain. In all seriousness the lad insisted “I am the captain.” Apparently the children take it in turns to act the role of different officers on the ship and are indoctrinated into actually believing they are really the character they happen to be portraying. Hubbard initially had some success winning over some of the locals, spreading his money around the local traders. In an interview with a Corfu paper he waxed lyrical about the “brilliant tradition of Greek democracy”. Almost in the same breath he praised the new constitution brought in by the military regime. But Hubbard’s bid to curry favour in Athens eventually collapsed – thanks to some degree to Forte’s vigorous lobbying. 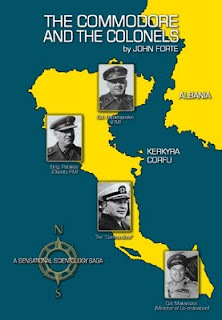 By March 1969 Hubbard and his fledgling Sea Org had been ordered out of Corfu. Hana Whitfield (then Eltringham), one of Hubbard’s captains during that period, met Forte for the first time when he came aboard the Apollo to deliver another message from the government. “It’s strange looking back because at that time I regarded him as my enemy, and an enemy of Scientology,” she recalled. Years later, after she had quit the movement, she received a letter from Forte. “I don’t know how he found me. And I don’t remember why he wrote; it was a kind letter with an inquiry… I was delighted to hear from John. “After leaving Scientology, I had often thought back to some of the more memorable times with Hubbard, the Corfu period being one such. His letter also reminded her how many times she had considered quitting Scientology while in Corfu. She had even thought about asking for his help. “It was an almost constant whisper in the back of my mind... It would not have taken much at the time for me to make the switch – a kind word, an extended hand… and I would have raced down the dock… away from the Apollo. “Being a loyalist to the core, I never acted on it, to my great regret later on,” she added. What she did not know at the time was that Forte had already helped several of her colleagues make their escape. Forte was a little put out to learn that the first edition of his book had already been webbed, much to the embarrassment of poor Chris Owen, the researcher who took the trouble to do the work – and did a great job of it. Owen put it on the Internet to rescue a valuable historical document from obscurity. He had no idea at the time that Forte was still going strong, let alone that he was working on a new version of the book. The new edition comes with an extra chapter using material culled from Hubbard Flag Orders, which Forte acquired from a former Scientologist – presumably one of those he helped jump ship. Major Forte celebrated his 94th birthday last week. Marc Headley was for years the best source of information about the abuse at the top of Scientology. A member between 1989 and 2005, he spent years working at the same base in Hemet, California, as the movement’s leader, David Miscavige. From early 2006, he started dishing the dirt on the violence and abuse he had witnessed there, posting on one of the best known Scientology message boards, Operation Clambake. He used the pseudonym “Blownforgood”: in Scientology terms, when you “blow” you quit the movement without going through the proper channels. Blownforgood, or BFG as he quickly became known, went into graphic detail about the beatings to which prominent senior members had been subjected. He reported how increasing numbers of young Sea Org members were being pressured into having abortions – for babies are off-policy in the Sea Org (for more on that see here and here). And as incredible as some of his stories seemed, many were subsequently confirmed in the St Petersburg Times’ ongoing exposé of the movement, which featured even more senior defectors, such as Mike Rinder and Marty Rathbun. What Headley witnessed at the Hemet base and what he personally experienced during his time in Scientology is the basis for the lawsuit that he filed in January against the movement. Marc Headley’s book Blown for Good: Behind the Iron Curtain of Scientology, has already attracted media attention following its November 5 release. One early review by Village Voice editor-in-chief Tony Ortega picks up on the fact that in the early 1990s Tom Cruise used Headley to practice his auditing skills – Scientology’s version of therapy. The headline says it all: “Tom Cruise told me to talk to a bottle”. The title of Nancy Many’s book, My Billion Year Contract refers to the documents that recruits to Scientology’s elite corp, the Sea Organization, have to sign. It means that they are committing not just for this life but for millions of future lives (with 21 years off between bodies – no kidding). I had the pleasure of meeting her during a research trip to California a couple of years ago. We drove around LA as she talked me through the mental breakdown she suffered towards the end of her involvement with the movement. She even pointed out the McDonald’s outlet where, in the middle of her psychotic break, she crawled into the children’s play area in a bid to distract the Marcabians, the alien race she believed had taken control of Scientology, from her son. Many’s book, released on October 26, contains harrowing details of her breakdown. It came when, after years of loyal service, the movement to which she had dedicated years of her life turned on her. I have so far only read a draft version of Many’s book. Much of what she relates, however – from her recruitment in the early 1970s to her final break with the movement in the late 1990s – follows a depressingly familiar pattern. She charts her initial involvement, (despite warnings from friends); the euphoria she experienced doing the early courses; and her eventual recruitment into unforgiving world of the Sea Org. There is vivid detail here about the pressure on staffers to meet the weekly deadlines and the harsh disciplinary code. For Many, that meant two spells in Scientology’s punishment programme the Rehabilitation Project Force (RPF) – the first when she was five months’ pregnant. And she tells how Hana Whitfield refused point blank to put her on an even tougher programme, known as the RFP’s RPF. Watching Hana spit out her anger and her refusal to obey was incredibly comforting to me. Hanna was almost finished with the RPF herself, almost free of the life in those blue boiler suits and a hot, filthy garage. She was risking her own graduation from the RPF to shield me from a fate worse than the one I was already in. In that moment I felt some protection for the first time in months. I will never forget that she put herself on the line that day at great personal and spiritual danger. Many also comes clean on her spying activities for the movement: for the Guardian’s Office Scientology’s intelligence unit during the Hubbard era; and later for its successor, the Office of Special Affairs (OSA). And her account of the Scientology auditing and harassment that led to her breakdown in 1996, speaks volumes about the destructive potential of Hubbard’s system. It also illustrates another sad truth about the movement: whatever you have done for movement in the past counts for nothing once you fall from grace. You can order John Forte’s The Commodore and the Colonels here. All three books are also available on Amazon. I will try to post more complete reviews of these books once I am in a position to pick up the copies I have ordered. Thanks for the news on Forte's new edition, that is a classic that shouldn't be missed. I also was blown away with your recent article in The Herald - explains much why your so thorough! Keep up the good works!! did you know that David miscavige change the Sea Org contract and now people sign only a "religious contract" why is this???? something legal??? I wasn't aware of that, but I can't see that it changes much. If Scientology is trying to get around labor laws by stressing the religious nature of the contract, it will still have to argue its case in court. Thank you for these reviews and your blog. I just read Blown for Good. It is shocking and horrifying to read what people have been subjected to at the International Base in Hemet. Some of the things these crazy people (Miscavige) come up with as punishments for others are almost beyond belief - tho I do believe Marc Headley's account which absolutely rings true as being genuine and accurate. One of the punishments he endured was having to participate, along with a large group of others, in cleaning up or remove dried human exrement at the bottom of a sewage settling pond with their bare hands, breathing the dust from the human waste for hours on end. And people were apparently so terrified about what might happen if they refused, tha they did it!! How can this go on in a civilized society? I will get around to reviewing the books by Nancy and Marc separately, but I have a bit of a backlog to clear.